Avebury Henge Stone #9 is remarkable because one can easily demonstrate that the carved shape of the stone on both frontal faces is determined by the stars in the stellar regions that are being represented. 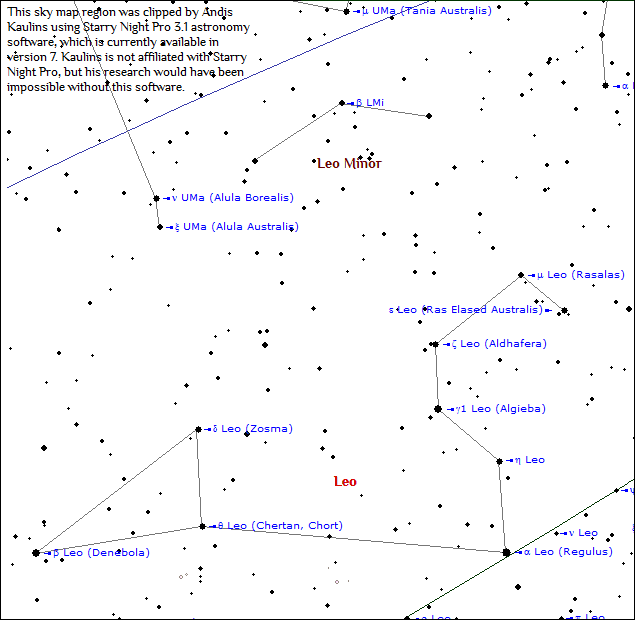 ANYONE can see this, astronomer and layman alike. Astronomers! What star region in the sky forms this shape? Can you spot the "nose" of the stone at the left? 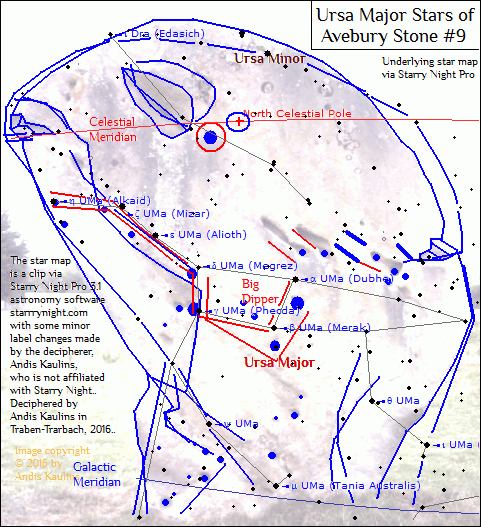 As for all stones at the main Avebury Henge Circle, stones were originally faced so that the "outer stars" i.e. Milky Way stars or stars on the Ecliptic and those below were represented on that circle facing henge-outward. 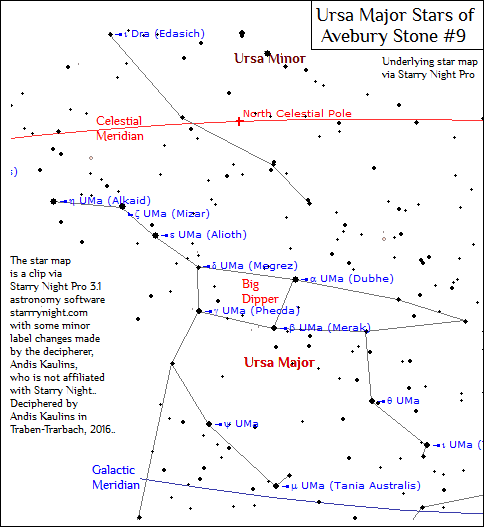 Logically then, for that system, stones marking "inner stars" toward the center of heaven, i.e. toward the North Ecliptic Pole and North Celestial Pole, were then originally placed looking henge-inward. Since the current Leo Frontal Face currently faces henge-inward, that is wrong, and the stone must be turned so that it faces henge-outward. P.S. We possess newer versions of both Starry Night Pro (version 7) and Paint Shop Pro (Corel Paint Shop Pro X5), but the older versions -- i.e. SNP 3.1 and PSP 7 -- give us just what we need for our graphic-based photo research, drawing and illustration. We also use Windows Paint XP and not the newer versions of Paint, including Windows 10, which are for our purposes far less suitable because they concentrate too much on razzle-dazzle and not on the essential basics. Really, modern software is a bit like Archaeology. NEWER does not necessarily mean BETTER. What star region in the sky forms this shape? How about Ursa Major and the Big Dipper? 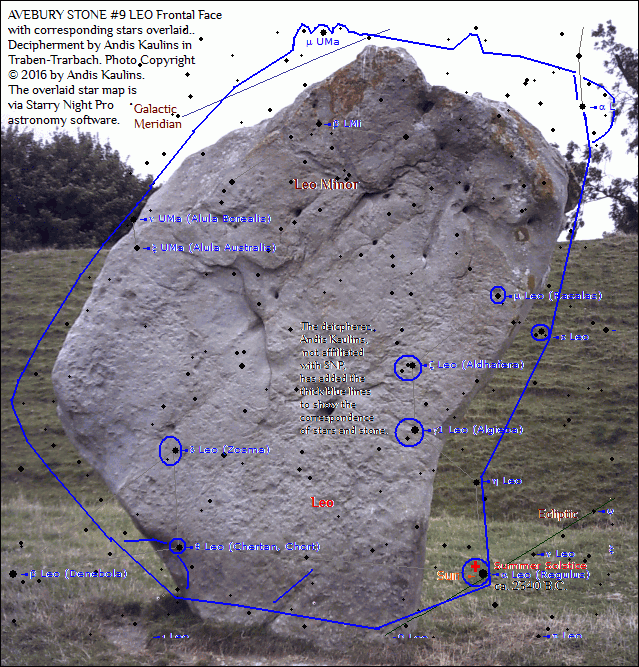 Since the current Ursa Major Frontal Face currently faces henge-outward, that is wrong, and the stone must be turned so that it faces henge-inward. 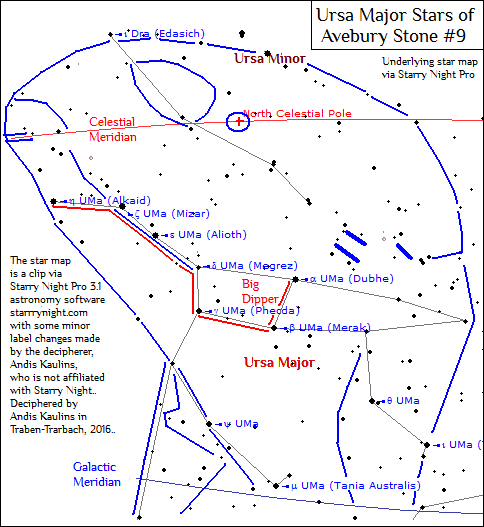 for all the doubters out there, in the next posting we will look at the other opposite frontal face of that same Avebury Henge Stone #9, and we predict that also that face of the stone will be carved in a shape blueprinted by the stars in that region of the sky that the stone is representing. 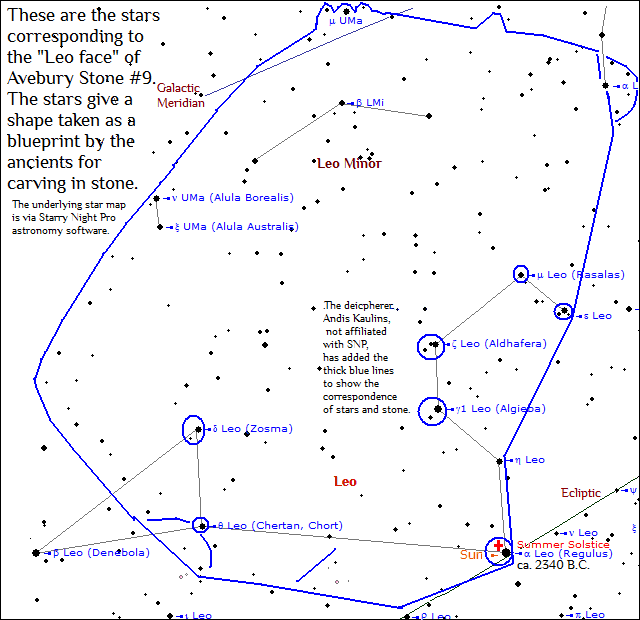 NOT ONLY THAT, but we predict that the stars there represented will be those stars directly below those represented by the Ursa Major Frontal Face, reaching from the Galactic Meridian to the Ecliptic, and thus properly facing henge-outward. 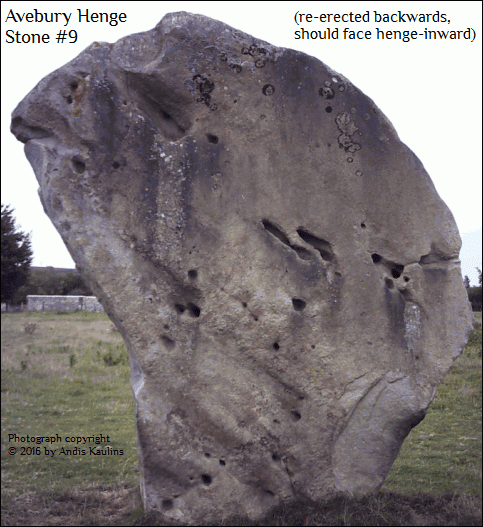 As will be clear by the end of our postings on Avebury Henge Stone #9, a megalith which was re-erected in 1938 by Alexander Keiller, the now henge-outward "face" side should have been set henge-inward, and the now henge-inward "face" side should have been set henge-outward. Also the narrower right and left "sides" of the stone are thus also to be reversed in their direction, i.e the stone must be turned 180°. In his era, of course, there was no way for Keiller to have known which side faced which way except through the original socket for the stone still present in the chalk underground, but that may have been ambiguous "either way". 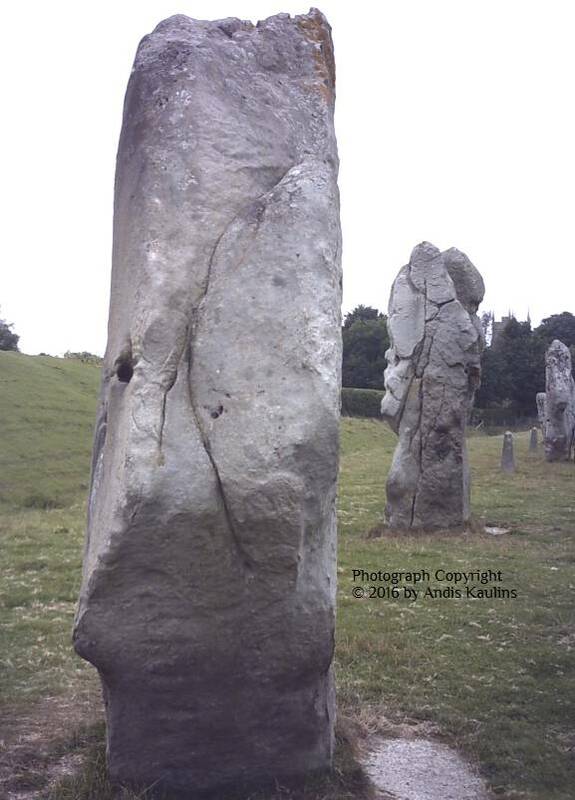 Our photographs below of the four sides of Avebury Stone #9 were taken on an overcast day, September 13, 2005, i.e. in weather which was not conducive to "artsy-craftsy" types of photos such as fill the Archaeology books. Rather, we were lucky that the overcast and partly rainy weather eliminated solar-caused shadows and permitted a no-nonsense photography of just the stones, without "artificial" aesthetic considerations. Only the STONES count here, not the "beauty" of the picture. Let's go! We first show simply The Two Faces and Two Sides of Avebury Stone #9. This "side" currently faces left when seen from the inner part of the henge. As we shall demonstrate, it must face Avebury Stone #10 (here in the background) and not Stone #8. The "side" seen below currently faces right as seen from the henge inside out. As we shall demonstrate, it must face Avebury Stone #8 and not Stone #10. Have you spotted some carved figures on the stone above? We now proceed to do some amazing things with the above photographs. Go to the next posting. 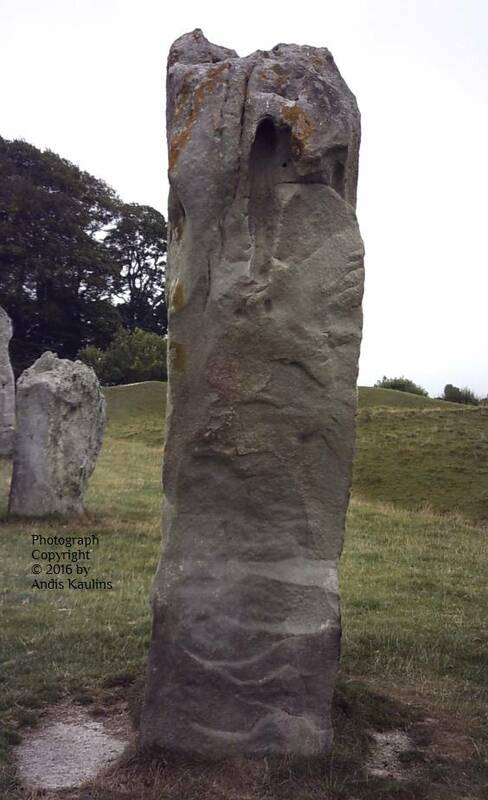 As proven in the next and subsequent postings, Avebury Stone #9, known popularly as the "Barber Stone" or "Barber Surgeon Stone" has been re-erected backwards. The megalith had fatally fallen upon a man in the 14th century but was only re-erected in 1938. As we shall prove, the correct henge-outward side was set facing henge-inward, and the correct henge-inward side was set facing henge outward. The sides are also thus 180° false in terms of the direction they face, which as we shall see, is important. How can we prove that? We can. We began our decipherment of the Avebury Henge Stones in August. 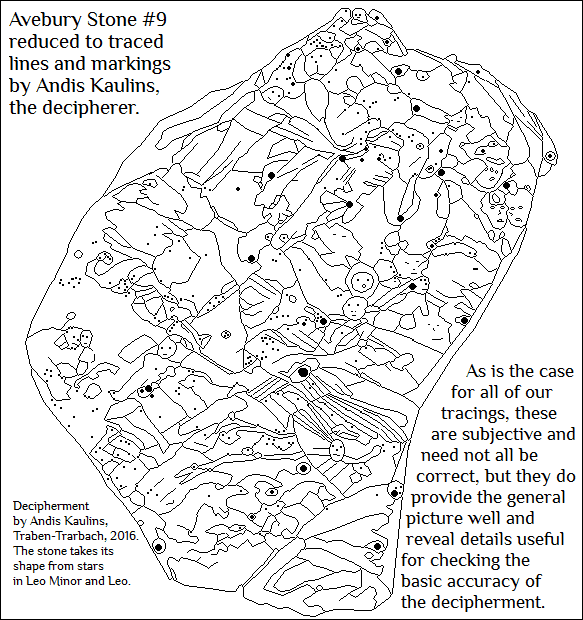 See our decipherment of Avebury Stone #10, the most important megalith at Avebury for understanding the "culture" of the henge. We at that time issued a challenge to archaeological and related communities, a challenge that has gone unanswered. 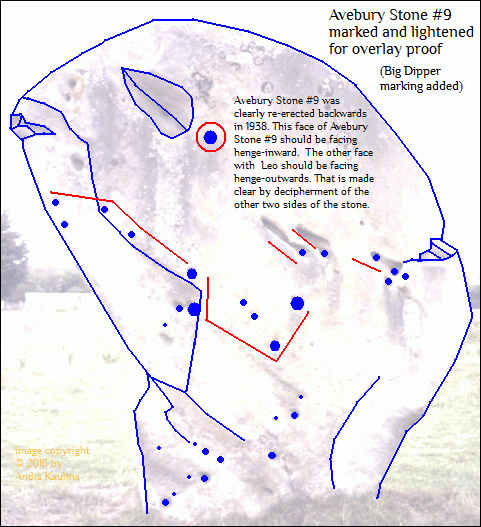 We now thus present our full decipherment of the Avebury Henge stones in this and forthcoming postings. The finder of what turned out to be a "modern" skeleton under Avebury Stone #9 was Alexander Keiller, an archaeologist to whom, however, great respect and honor must be given for his restoration and conservation of the Avebury site in his lifetime. He more than anyone can surely be regarded as the modern "guardian angel" of Avebury, who in his day resurrected much of what could be resurrected, and without whom the present Avebury site presence would surely have been impossible. However, even Keiller apparently destroyed some of Avebury, e.g. at least parts of the northwest bank, by using explosives to clear out tree stumps, etc., but his comprehensive restorations far outweigh any errors that he made. Keiller can also not be faulted that he re-erected Avebury Stone #9 backwards. How was he to have known which side faced henge-outward and which side henge-inward? The stones have original "sockets" still found in the chalk underground, so in many cases the proper placement of the megaliths is quite clear, but this socket may have been ambiguous, permitting the stone to be erected either way. Well, there is a sure way to know which way is right. And we reveal that shortly, not just for Avebury Stone #9 but for all the outer henge stones. Because the skeleton is dated to the early 14th century, it has nothing, absolutely nothing to do with a correct understanding of the Avebury stones, except that it proves that the stone was re-erected, and, as we show, falsely. The National Trust features the skeleton story currently at its Avebury Stone Circles and Henge page, writing in that connection about Avebury as being allegedly "pagan stones". "Pagan stones" they are not. 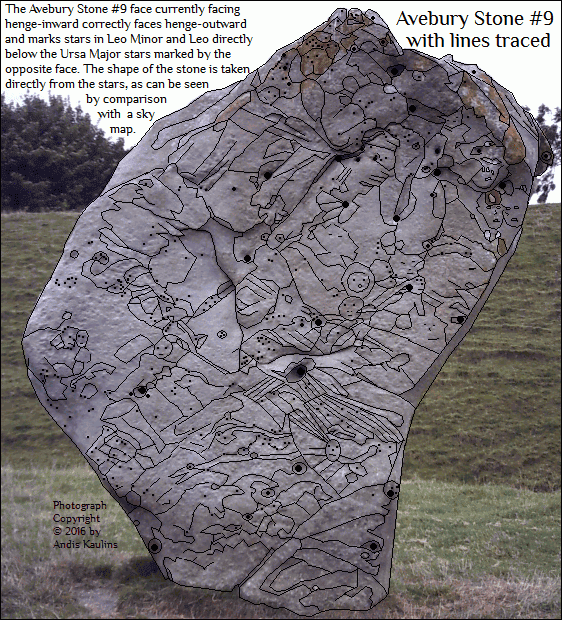 That will be seen when we examine Avebury Stone #9 in detail. We "trust" that such a misleading "pagan" label will soon be deleted by the National Trust and that the archaeological community will start viewing these megaliths as the wonders of the ancient world that they are, created by ancient mankind as marvelous examples of ancient technology. People sadly seem to prefer emoting unproven subjective mainstream assumptions rather than to do the first thing that true science requires here, which is to LOOK at the STONES themselves and to EXAMINE THEM in detail. We have thus chosen Stone #9 intentionally because it is a stone that many have heard of because of its "circus-like" skeleton aspect, so that there is little excuse among the academic professions for not having examined that stone "scientifically". The stone is not obscure. There have been many opportunities, but no one has done the close examination required. We on the other hand have now examined Avebury Stone #9 in a bit more detail than has done previously. We might mention here that we just finished reading Steve Marshall, Exploring Avebury: The Essential Guide, a book that was just recently published (September 2016) by The History Press (www.thehistorypress.co.uk). The reader can thus presume that we understand most of everything in that book and are aware of what is known and what is not known. Indeed, we use the stone numbering employed there for the inner circle stones, which was otherwise not available anywhere online, nor did our other books have it. It is informative in reading Marshall's quite beautiful book to see how much information is actually "known" about the broader "archaeotech" environment of the Avebury stones, and yet, it is equally amazing to see how very little is understood by the archaeological and related communities about the true function of the stones themselves -- a deficit which we are now in the process of correcting, especially via Avebury Henge Stone #9. In spite of its excellent photos and great informative value, Marshall's book shows the reader tiny photographs of ONE side of each henge stone only (pp. 66-68), plus only a few larger photos of the stones in their Avebury Henge quadrants. This presentation is disappointing. The STONES themselves are most important, not all the marginal things published by the archaeologists. We hope in the book's next edition for great improvement on that score. We shall in coming postings show large photographs of every "face" and "side" of every stone -- and such a comprehensive view of each stone is the key to understanding all the stones. Everything counts! Having already done Avebury Henge Stone #10, we continue now with Avebury Stone #9, which we shall prove to be set in place backwards viz. reversed as regards its original correct position, and of course, there is more, much more.